So, Martina, could you please tell us a little bit about yourself and your background? 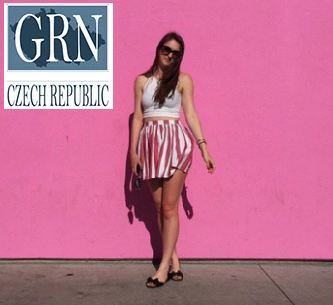 I am a 21 year old student from the Czech Republic and always interested in traveling and meeting new people. That is why I am off for an exchange in China for one semester. Before my internship here in Prague with GRN, I was living and studying in Rotterdam, where I completed my Bachelors degree. Well in fact I am from Prague and my parents live here, so the reason that I was looking for an internship in Prague. This has been an interesting and exciting opportunity for me. Even though I am from the Czech Republic, in Prague I always find something new to discover. There are so many beautiful places to visit! I’m taking care of the social media channels of GRN and everything related to that, such as writing blog posts, reading interesting articles to share, searching for pictures and quotes and so on. I’ve also contributed to the updated social media strategy for GRN and in helping to come up with new ideas for the future. I was also responsible of finding my successor, which included reviewing CVs, organizing interviews with the potential candidates and dealing with the whole recruitment process until the day that she would arrive. Definitely, international experience is always valuable and it’s something that I believe will differentiate me from other candidates when I’m searching for a job after graduation. And also, it’s an advantage for me to see the recruitment process from another perspective. This question is not so easy to answer because I have a lot of plans from today to implement in the future. Now, after having gained some very good experience in GRN Czech in working with many people, and where I had opportunities to do varied kinds of activities with friendly and professional people, first my plan is to not stop but to keep the momentum going and get much more knowledge and experience. So, I am planning to go to China for an exchange program for the fall semester in order to recognize new people, new culture and to gain new international experiences, which will help me to accomplish my goals in the future and to become professional at my field of study.